The Global Volcanism Program has no activity reports for Homa Mountain. The Global Volcanism Program has no Weekly Reports available for Homa Mountain. The Global Volcanism Program has no Bulletin Reports available for Homa Mountain. Homa Mountain is a large carbonatitic complex with a flat-topped summit that forms a broad peninsula on the E shore of Lake Victoria. This dominantly Miocene-to-Pleistocene complex contains numerous flank vents, including the carbonatitic and ultramafic Lake Simbi maar on the lower E flank. The Chiewo, Got Ojawa, and Got Oloo vents on the S and W sides of Homa Mountain were formed during the latest stage of carbonatitic activity. Legends of inhabitants near the Lake Simbi maar suggest that it may have been formed in historical time. Le Bas M J, 1977. Carbonatite-Nephelinite Volcanism. New York: John Wiley, 347 p.
The Global Volcanism Program is not aware of any Holocene eruptions from Homa Mountain. If this volcano has had large eruptions (VEI >= 4) prior to 10,000 years ago, information might be found on the Homa Mountain page in the LaMEVE (Large Magnitude Explosive Volcanic Eruptions) database, a part of the Volcano Global Risk Identification and Analysis Project (VOGRIPA). There is no Deformation History data available for Homa Mountain. There is no Emissions History data available for Homa Mountain. The Homa Mountain volcanic complex rises beyond a Smithsonian Department of Anthropology archaeological site north of the volcano in which Miocene-Pliocene hominins were excavated. 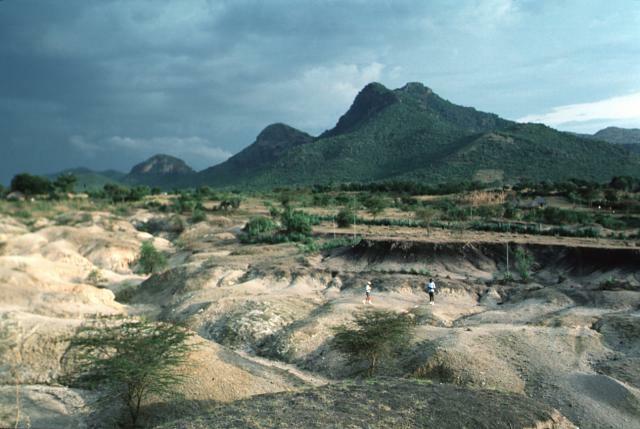 Homa Mountain is a dominantly Miocene-to-Pleistocene carbonatitic complex that forms a broad peninsula on the eastern shore of Lake Victoria. Numerous flank vents include the carbonatitic and ultramafic Lake Simbi maar on the lower east flank. Legends of inhabitants near this maar suggest that it may have been formed in historical time. Photo by Chip Clark, 1994 (Smithsonian Institution). IRIS seismic stations/networks Incorporated Research Institutions for Seismology (IRIS) Data Services map showing the location of seismic stations from all available networks (permanent or temporary) within a radius of 0.18° (about 20 km at mid-latitudes) from the given location of Homa Mountain. Users can customize a variety of filters and options in the left panel. Note that if there are no stations are known the map will default to show the entire world with a "No data matched request" error notice. Large Eruptions of Homa Mountain Information about large Quaternary eruptions (VEI >= 4) is cataloged in the Large Magnitude Explosive Volcanic Eruptions (LaMEVE) database of the Volcano Global Risk Identification and Analysis Project (VOGRIPA).